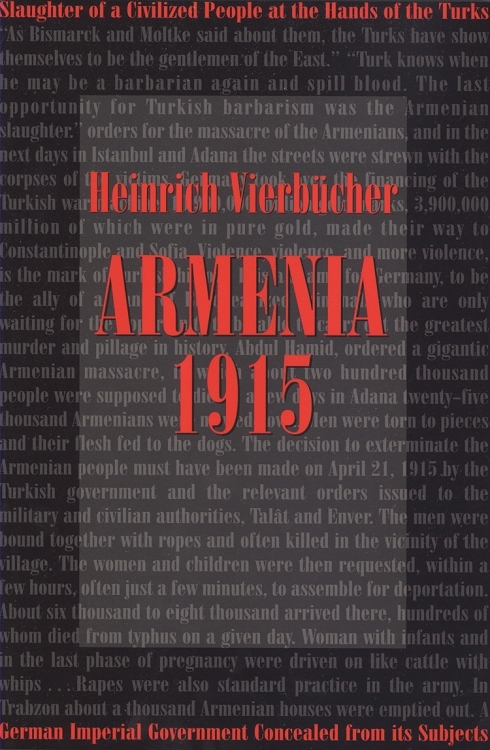 Armenia 1915 is the personal account of Heinrich Vierbücher (1893-1933), a lecturer and peace activist who lived in Ottoman Turkey from 1914 to 1917. As the interpreter for Marshall Otto Liman von Sanders, he traveled throughout Anatolia and was an eyewitness to the Armenian genocide. In his account, Vierbücher vehemently condemns the Ottoman government for its premeditated slaughter of over one and a half million Armenian subjects, while simultaneously emphasizing the co-responsibility and complicity of the Imperial German government in the massacres. Armenia 1915 is enhanced by genocide scholar Vahakn Dadrian and editor Ara Ghazarians's notes and introduction, which serve to better situate Vierbücher testimony in its historical and political contexts.